My poor Web site is in the ICU, so until it's feeling better, I hope to provide enough info here to answer any questions you might have about my books. Noah Lassiter wants nothing more than to find the driver who killed his good friend. But his only lead is the beautiful Charlie Trudeau, who gets prickly when he starts nosing around town. Charlie’s clearly hiding something, but Noah needs her help unraveling the mystery of his friend’s death—even if the electricity between them complicates things. Reporter Charlie Trudeau stood on the curb and stared at the stoplight that glowed red in the March sunshine. This was her life at the moment. Ready to make a difference but waiting for someone else to give the green light. So much for journalists being the public watchdog. The drive for advertising revenue had changed much of the newspaper industry from a Rottweiler cornering the bad guy into a fluffy toy poodle begging for a treat. Which meant that using her job to help the innocent, helpless and screwed wasn’t going to happen, at least not in Southwest Florida at the Lake Avalon Gazette. Charlie looked up, surprised as much by the sound of the voice as the name. No one but her mother called her that. She glanced behind herself, checking to make sure the woman had indeed waved at her. Which was silly, really, to think that another woman with the same given name would be standing right behind her. The woman hurried across the street toward her. The rev of an engine startled Charlie out of her confusion, and in the next instant, a sporty white car sped full-bore into the intersection, and into the smiling pedestrian. Charlie lurched forward a step, watching in stunned horror as the woman’s body pitched across the car’s hood, struck the windshield with a horrible thud and flew over the tan ragtop. The car screeched off while the woman’s body tumbled wildly across the pavement before coming to a motionless rest, face up, in the middle of the street. Charlie tore across the asphalt, fumbling for her cell phone to call 911. She dropped to her knees beside the sprawled pedestrian, the phone pressed to her ear. Come on, come on, answer. 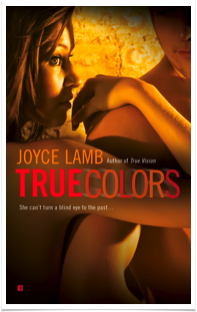 Blood trickled from the corner of the woman’s mouth, and the side of her face was scraped raw. Who knew what other injuries she’d sustained? But, thank God, she was breathing. “911 emergency,” a man with a deep voice said in her ear. The line went silent, and Charlie stared down at the injured woman, not knowing what to do. Should she run to the paper for more immediate help? But, no, she couldn’t leave her unprotected. She could get hit by another car. And Charlie knew that moving an injured person could cause more damage, so she stayed where she was, the heat from the asphalt leaching through the knees of her khakis, the sun on the back of her neck. She looked up, expecting to see other witnesses or perhaps the car’s driver fretting about whether he or she had just killed someone. But the area was deserted. Hearing a small gasp, Charlie glanced down. Her racing heart jammed into her throat when she saw the pedestrian’s light brown eyes keenly focused on her face, as though she were counting on Charlie to save her. Her lips moved. She was trying to say something. Instead of answering, the pedestrian tightened her hand around Charlie’s with surprising strength and stared intently into her eyes. “Charlotte,” she whispered just before her fingers fell slack, and it took Charlie a few seconds to realize she was staring into the face of a dead woman. Oh, God, no. The world abruptly shifted, and Charlie was no longer holding a dead woman’s hand. She was across the street, sprinting toward the intersection, hope and excitement rising in her chest as she spotted the woman she was looking for. An engine revs, and I jerk my head up to see a white car bearing down on me. Before I can do anything but flinch, I feel crushing impact, feel myself flying through the air, then the bone-breaking shock of striking the road and rolling uncontrollably. In the next instant, Charlie was back, kneeling on the pavement, unhurt, her fingers clamped around the dead woman’s hand. Sirens began to scream in the distance. Alex Trudeau spotted the flashing lights of a police cruiser and pulled onto the shoulder of the beach road. She’d heard the call for emergency vehicles over the scanner when she’d been only a mile away. Hopping out of her dark red Jeep Liberty SUV, she dragged her camera equipment out then took off at a jog toward the scene of the accident. The heat of the Florida sun baked the asphalt under her feet, but she barely noticed as she ran, dodging the drivers and passengers who’d pulled over and gotten out of their cars to gawk. As she neared the mangled wreckage of a silver minivan upside-down in the ditch, she started snapping shots even as her stomach clenched. Could anyone have survived an accident so violent that it shattered the windshield and caved in the roof? Alex’s journalistic instincts snapped back into gear when Logan, tan and muscular in his khaki police uniform, turned back toward the van that had started to smoke. Big, black clouds, the kind that looked like a precursor to a fiery explosion, billowed upward. She could tell by his determined stance that he was going back for the driver’s baby. Where the hell were the fire trucks? At least firefighters were experts at this kind of thing. Yet, she’d known John Logan for two years, considered him a good friend, and he wasn’t the kind of man to stand around and wait for someone else to show up and do what he could do right now. Alex listened only vaguely, heart slamming against her ribs as Logan plunged into the billowing smoke. Alex counted the seconds as she waited for Logan to reappear. Sirens sounded in the distance, but they seemed so far away, her focus having narrowed down to the spot where she’d last seen Logan. She should have been taking more pictures of the chaotic rescue scene, but fear for him had constricted her chest muscles so much she could barely breathe. Come on, Logan, where are you? This can’t end in tragedy, she thought. Logan was too good, too kind. She accepted that bad things happened to good people. Not this time, she prayed. Please. And then he stumbled out of the smoke, a small child of maybe two or three years old cradled in his arms. Alex released her held breath on a gust of air and brought the camera up to take the picture, already knowing it would make headlines. There was nothing newspaper readers loved more than a ragged hero streaked with blood, carrying a crying, soot-smudged child away from wreckage that looked like no one should have survived. Especially a hero as good-looking as John Logan, his eyes even more blue in a face blackened by smoke, the child looking tiny and helpless in his large, muscled arms. Logan delivered the bawling little girl to her mother, his eyes streaming from the smoke. Sweat made his short, dark brown hair spike. He was filthy, yet he’d never looked more gut-wrenchingly handsome. Then, surprising Alex, he walked over to her, his teeth flashing white in his streaked face. “You got here fast,” he said. She managed to prevent a hitch in her smile at the reminder that she’d technically died three months ago. A man gunning for her sister had shot Alex by mistake. Three zaps from defibrillator paddles in the ER had revived her. She shivered at the heat in his starburst-blue eyes. He made her nervous. In a good way. A very good way. Before the shooting, she’d thought they were gearing up for their first kiss. After the shooting, he’d visited her in the hospital and had dropped by her house a couple of times after her release, armed with the makings for hot fudge sundaes and DVDs of old, quirky, dog-themed movies like Best in Show and Beethoven. That he’d known her well enough to cater to her love of sugary treats and animals had thrilled her. She’d thought, This is the man of my dreams. But then he’d pulled back, and she’d thought maybe he’d lost interest. She had to admit she was pretty pathetic after taking a bullet to the chest. No doubt, her inability to carry on a conversation, or watch an entire movie, without drifting off had been a huge turnoff. But she was better now, and here John Logan stood, grinning at her after saving a helpless child from certain death. Things were looking up. “What’re you doing for dinner tomorrow?” he asked. A big, dumb smile spread through her entire body, more intense than anything she’d felt in a long time. In fact, ever since the shooting, she’d felt different. She figured death did that to people, made them more aware of the people around them. Made them feel emotions—compassion, pleasure, pain, anticipation—on a deeper level. Or maybe her senses just seemed sharper, like a head that felt lighter, and better than before, once a blinding headache faded. Whatever the cause, she thought she might have a serious crush on this man. She laughed, low and breathless. Could the man get any more appealing? I’m choking on smoke, eyes tearing as I fumble a door open and lurch inside the van, drawn by the cries of a small child. I’m not losing this one. Not this time. Where is she? Can’t see a damn thing. The inside of the van is hot, too hot. Just give me time. A little more time … and then something warm and soft brushes my fingertips. I close my fingers around a soft, pudgy leg, trying to be gentle even as the need to hurry, hurry clenches in my gut. I use the leg to guide me to a car seat. Strapped in, the seat and the kid. Glimpse of pink flowers on a white T-shirt. A little girl. Small and helpless and counting on me. This child’s not dying, damn it. I can’t see, can’t find the mechanism that releases the straps. And I smell hot metal, burning plastic and rubber, hear a weird, ominous crackle. Flames? Still no straps, hands frantic as they move over the screaming, squirming kid, searching, searching. Finally, there it is. The latch. Jesus, the metal’s hot. Everything is so hot, making the sweat pour into my eyes, stinging along with the smoke. Two more seconds, and the latch is free, the girl all but sliding out of the seat into my arms. I crawl backward, out of the death trap, into humid, smoke-choked air. My lungs ache, burn, my throat raw. An explosion shook the world. Samantha Trudeau has spent the past ten years using her intense psychic abilities to put bad guys behind bars. She's always believed she’s one of the good guys, until fellow spy and best friend Zoe reveals a shocking secret about who they've really been working for. When Zoe's gunned down, Sam goes on the run, because now her employer is coming after her. With no one to turn to for help, she flees to the only place she thinks she’ll be safe. Journalist Mac Hunter has had a rough year. At the insistence of his good friends, sisters Charlie and Alex Trudeau, he’s going to crash at their family cabin for some much-needed rest and relaxation. But when he arrives he’s stunned to find the third Trudeau sister, Sam, wounded and unconscious on the cabin floor. Things go from bizarre to dangerous when men with guns show up. Now, Sam and Mac are on the run together, trying to outsmart a demented government agent who has sadistic plans for Sam. As the heat builds between them, her past threatens their very survival. This unlikely duo -- a man who uses words to fight his battles and a woman who'd rather use a Glock -- are in for the fight of their lives. And in their growing partnership, perhaps they'll have a true shot at love. Sam closed her eyes and gritted her teeth against the throb of pain in her shoulder. Focus, damn it. It’s what you’re good at. What you’re trained to do. Soldier on. Accomplish the mission. Get to the cabin. Hunker down. Hide. Get warm. God, she couldn’t wait to get warm. Blinking cold rain from her eyes, she squinted into the growing dusk, trying to get oriented. The cabin was around here somewhere. She was sure of it. Unless she’d gotten herself lost. No. She wasn’t lost. She knew where she was going. Just like you knew where you were going when you ran away from home fourteen years ago? She peered through the rain running in rivulets over her forehead and into her eyes. She couldn’t see a damn thing. Just towering trees decorated in gold and orange and red. The same coppery red that spattered her Nikes and the leaves squishing underfoot. Her feet were cold and wet, just like the rest of her. At least she still shivered, the body’s way of creating its own warmth. But, crap, she’d been shivering for so long and so hard that she should have generated enough heat to warm a small house. If she didn’t find the cabin soon, she was toast. And not the warm, golden brown kind. She battled back the wave of grief that tried to steal her breath and forced herself forward, one foot after the other. Don’t think, don’t think. But she couldn’t help but think. Zoe was dead. Her closest friend. Don’t go there. Don’t go there. Then she saw it. The Trudeau family cabin. Materializing out of a copse of amber gold and dark orange trees. An honest-to-God log cabin. A rush of much-needed warmth spread through her blood. Almost home. As close to home as she’d gotten in a decade. Wouldn’t it be cool if her sisters and parents waited for her there? Alex and Charlie and Mom and Dad. She pictured the cozy living room with its stone fireplace and polished wooden floor, the big, overstuffed couch with the red-and-black plaid blanket draped over the back. She imagined that blanket draped around her shoulders, imagined sinking into the poofy cushions and drifting off, wrapped in the familiarity of home away from home. She found the key in its place, tucked into a cleverly carved notch three feet up from the planks of the porch. Her half-frozen fingers fumbled with it, missed getting it into the lock the first three tries. Hot tears streamed through the cold rain on her face. Stupid, so stupid. Crying now, after everything that had happened, after so many years of not crying. N3 operatives didn’t cry. N3 operatives carried on. Her hands trembled as she finally nailed the lock and heard the tumblers squeak open. The door swung inward, and she all but tripped over the raised threshold into dust-choked air and a musty odor that didn’t smell at all like the cabin she remembered. Where was the scent of fresh-chopped wood? The hint of fabric softener that spoke of clean sheets on big, soft beds? She dropped her dripping bag on the floor and pushed the door closed, her arms and legs leaden now, weighed down by her sodden denim shirt and jeans. All she had to do was make it to the couch and get the blanket, and she’d be warm in no time. But her knees buckled, and as they hit the floor, a fist of pain slammed through her shoulder. A burst of light flashed the world bright, and she flinched. A deep, quaking rumble vibrated the worn wooden floor under her knees. Thunder. On the next burst of lightning, she noticed the pink water pooling near her left knee. Oh, yeah. She’d been shot in the shoulder. Funny how she couldn’t feel it anymore. In fact, she couldn’t feel much of anything. Maybe that should alarm her, but somehow it didn’t. It figures, she thought. Make it almost home, and it wasn’t going to matter. She was still going to die alone. 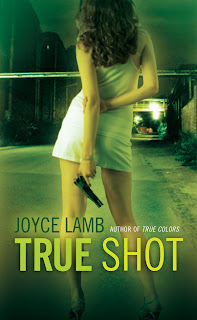 Award-winning author of romantic suspense novels, including True Vision, True Colors and the recently released True Shot (True Colors and True Shot are both 2012 RITA finalists). Also the curator of USA Today's Happy Ever After blog about all things romance novels. (happyeverafter.usatoday.com).